Weather experts are predicting that the central North Carolina region of Raleigh, Durham and the Triangle is likely to expect a wet and cold winter this year. Add wind to the mix and you will probably start to notice how well (or poorly) the windows work in your house. Over time, window seals, sashes and frames age and become less efficient at keeping cold air out in the winter. Choosing the right window system depends on how much of the window needs replacing. The experts at Gerald Jones Company are happy to work with you to assess your existing problems. There are multiple different window components to consider for replacement: sash replacements, sash replacements in a unitary frame and “prime windows,” or full window units with structural frames and sills like those used in new construction. If you see signs of water damage or rot in the window framing, you’ll probably want to opt for new prime windows. If the frames are solid and intact, you may be able to get away with simply replacing the sash. If you notice condensation or a “foggy” appearance on the glass pane of your windows, it is likely a sign of a blown window seal. These cases can sometimes be fixed by replacing just the glass pane and seal, as opposed to the entire frame. Awning. Hinge at the top and open away from the home. Because the sash closes by pressing against the frame, they generally have lower air leakage than sliding windows. Casement. Hinge at the sides like a door. Like awning windows, they generally have lower air leakage rates than sliding windows because the sash closes by pressing against the frame. Fixed. Fixed panes don’t open. When installed properly, they are airtight, but are not suitable in places where window ventilation is desired. Hopper. Hinge at the bottom and open to the top, and are typically used in basements. Like both awning and casement, they generally have lower air leakage rates. Single- and double-sliding. Sliding windows operate horizontally along a plastic or metal track. 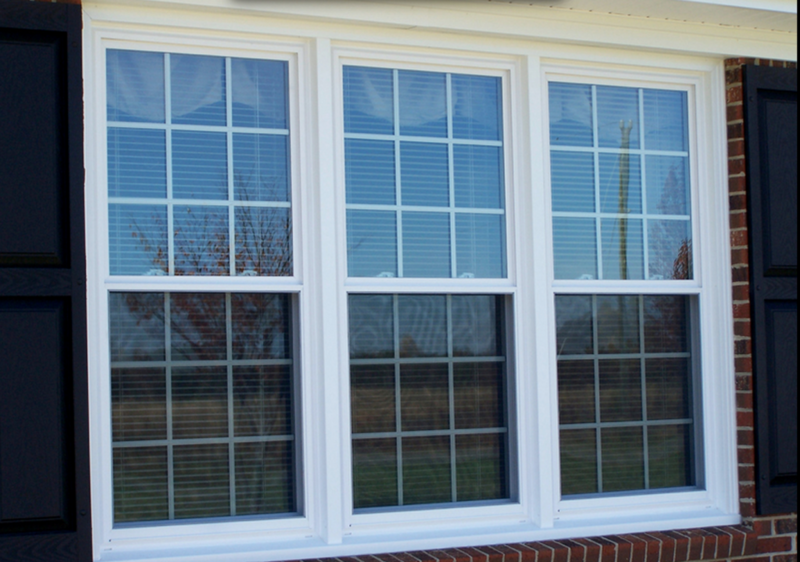 Like single- and double-hung windows, they generally have higher air leakage rates than projecting or hinged windows. Gerald Jones Company has been in the business of window replacement for over 60 years, which means we have handled just about any window problem you could imagine. Give us a call today to set up an appointment for us to come take a look at your home and see how we can help make your windows a point of pride for your home. 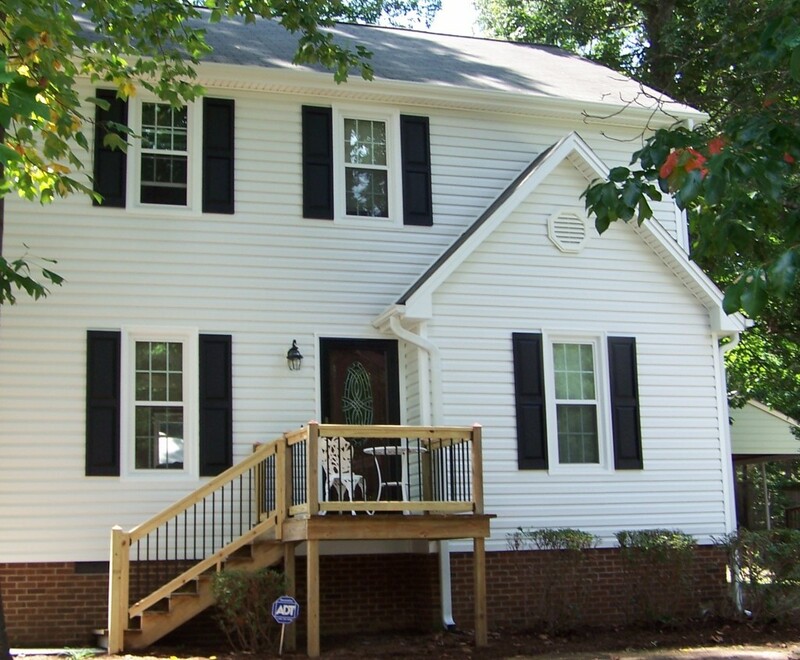 Raleigh-Durham home with new vinyl framed replacement windows, new insulated vinyl siding, new vinyl raised panel shutters and new wood front porch. This entry was written by Gerald Jones Company, posted on January 18, 2016 at 3:29 pm, filed under Uncategorized and tagged home improvement, home remodeling contractor, Raleigh Durham, window replacement, windows. Bookmark the permalink. Follow any comments here with the RSS feed for this post. Both comments and trackbacks are currently closed.